Honey cakes are traditional for Rosh Hashanah, the Jewish New Year that falls this weekend. 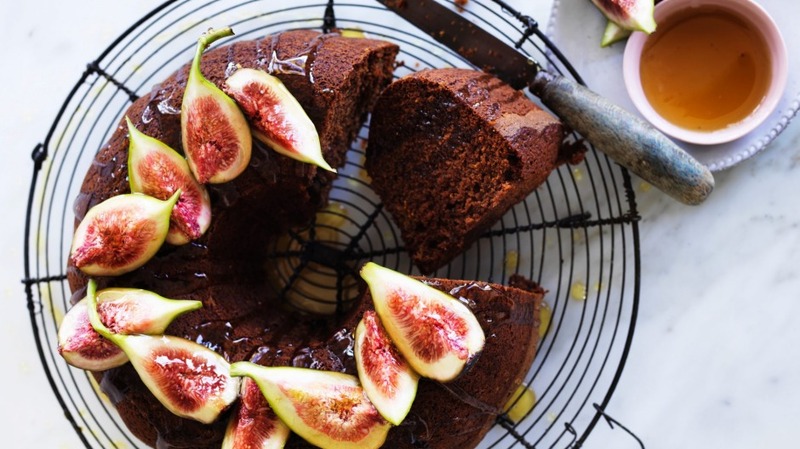 With added figs and whisky, my version may not be traditional, but it's the best honey cake I have tasted. The rye flour adds complexity, but you could also use all white flour if you prefer. When making, use an 8-cup capacity bundt cake tin with a central tube: there's a lot of liquid in the batter, and the tube adds support as it bakes and rises. 1. Preheat oven to 200C (180C fan-forced). Grease the cake tin lightly but thoroughly with the butter or vegetable shortening, then dust with the extra flour, shaking the tin so it is evenly coated. Tap away excess flour, and place in the freezer. 2. Warm the honey in a medium-sized saucepan over low-medium heat, gently swirling the pan so it heats evenly. When bubbles begin to form all over the surface, increase the heat to medium and simmer for 1 minute, then remove from heat and carefully add oil, water, whisky, figs, orange zest and bicarbonate of soda. Stir gently to combine, then set aside. 3. Sift together the flours, cocoa powder, spices and salt into a bowl, then set aside. 4. Beat the eggs and sugars in the bowl of an electric mixer using the paddle attachment and cream until mixture has lightened. Add the honey mix in three batches, alternating with the sifted dry ingredients, and mix gently until combined. Use a rubber spatula to fold through any floury bits, then scrape the batter into the prepared, chilled cake tin. 5. Bake for 50-55 minutes, or until a skewer inserted near the centre comes out clean. Allow cake to cool completely before taking it out of the tin. Wrap in cling film and set aside at room temperature for at least 1 day, then serve with fresh figs and honey. Tip: This cake is best eaten the day after it's made, and improves further over a few days.